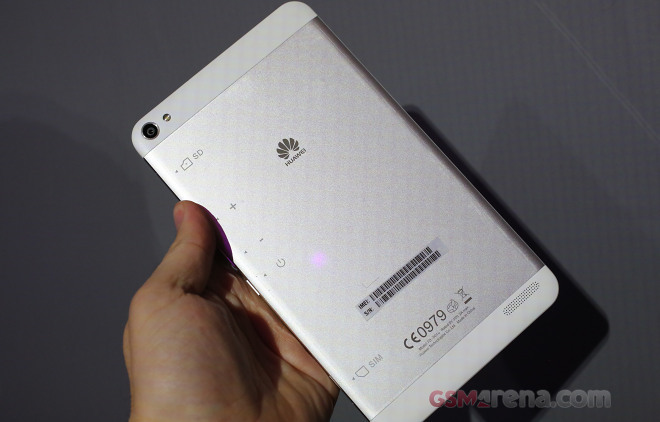 The Huawei MediaPad X1 is the pinnacle of the company’s presentation on the MWC 2014. It is the most interesting device Huawei has brought to Barcelona and there is indeed a lot to discuss. Even though the MediaPad X1 is a 7″ slate, Huawei considers it as an all-in-one device and believes many users will be carrying and using it as a primary (and only) gadget. Yes, this means people will make calls on it. But first things first. Huawei MediaPad X1 is an incredibly slim tablet, in fact Huawei claims it is the world’s thinnest 7″ slate with its 7.18mm thickness. It is also smaller and lighter compared to the iPad mini and the latest Nexus 7 slate. Huawei MediaPad X1 packs a 7.0″ IPS display of 1200×1920 pixels resolution (that’s 323ppi). The screen-to-body ratio is 80%, which means incredibly thin screen bezels – just 2.99mm. The display is fully laminated and offers 515 nits brightness. Finally the 7″ screen uses LTPS (Low Temperature Poly-Silicon) technology, which allows for more dynamic and rich colors, less battery consumption and better responsiveness. The MediaPad X1 is powered by Huawei’s newest HiSilicon Kirin 910 LTE-enabled (Cat.4) chip with a quad-core 1.8GHz Cortex-A9 processor, Mali-450 GPU and 2GB of RAM. The camera department on the MediaPad X1 gives you a 13MP rear camera and a 5MP front one for high-res selfies. Finally, the MediaPad X1 packs the whooping 5,000mAh battery, which should provide you with 15 hours of web browsing, 125 hours of music playback, more than 8 hours of video streaming or more than 10 hours of video playback. The 5,000mAh can also be used as a portable battery – the MediaPad X1 is capable of reverse charging and could be used to charge another device. Nice! So, the MediaPad X1 looks really beautiful. Since it is intended to be used as a primary device, you can notice the earpiece above the screen and the microphone at the bottom side of the slate. The left side hosts nothing, while the right has the SIM and microSD beds plus the volume rocker and the Power/Lock key. The internal storage, by the way, is 16GB. The top and bottom of the MediaPad X1 have the two microphones, the 3.5mm audio jack and the microUSB port. The back of the Huawei MediaPad X1 is made almost entirely of metal. The 13MP camera accompanied by a LED flash is over the top plastic band, while the loudspeaker grille is at the bottom band. Huawei MediaPad X1 is indeed a very interesting device. It runs on Android Jelly Bean skinned with company’s Emotion UI 2.0, but the final Android version wasn’t specified at the announcement, so it might as well come with KitKat once it hit the shelves. The suggested retail price of the X1 is €399. You can check our full scoop on the Huawei’s MWC event right here.